There have been rapid and important advances in all behavioural sciences in recent years. These advances have in one sense been very diverse and specialised - sufficiently so for a scientist to quickly lose touch with the current concerns of even neighbouring researches: but in some cases the developments have seemed also to be fundamental and perhaps convergent, with implications across a range of disciplines. In either case there is a real, and increasing, need for scientists to communicate their discoveries and to a new generation of students in their own. Problems in the Behavioural Sciences is designed to meet this need. The books are by leading researchers, and deal with problems or topics that are attracting a special current interest. The central subject matter is psychology, but many of the issues will need to be pursued across existing (and fluid) boundaries between psychology and other behavioural sciences like physiology, pharmacology, sociology, ethology and linguistics. The central idea of this book is that biology, and particularly evolution, provides the best starting point for the study of emotion. In particular, it is argued that all the conventional properties of emotion such as expression, feeling, and motivation can be considered in a scientific manner, and useful conclusions drawn therefrom. The major part of the book involves the application of this central idea to a wide variety of the phenomena of emotion. The resultant review should be useful as an undergraduate text, and so explanations in the text are aimed at the non-specialist. At the same time, the specific conclusions drawn in the book should be of interest to all those who do research on emotion, and particularly those who need a solid framework on which to base interdisciplinary studies. 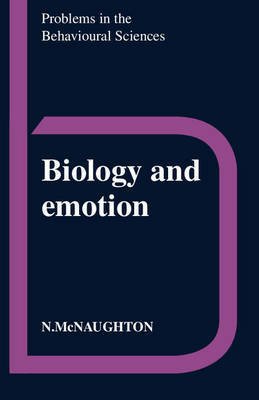 Biology and Emotion differs from the majority of books in the field in that it does not present a specific theory of emotion. The material covered is therefore more general than is often the case, and has not been selected to support a particular point of view. It combines an organised, yet artheoretical, approach with coverage of both animal and human emotions.